Learn how to create and manage your contacts and groups. Select "New Contact." Choose either the "brief view" or "detailed view" then enter the information for the contact you want to add. Click "OK" to save. Select the contact name you wish to edit or delete. This will open the contact’s information. Choose "Delete" to delete the contact or make changes to the contact's information and click "OK."
Select "New Group" and enter the name you want to give the new group. 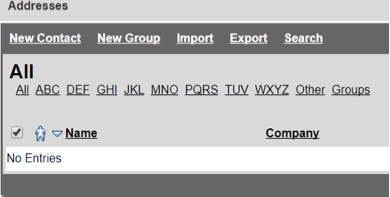 Select the contact(s) you want to add to the group and click "Add". Click "OK" to save the group. It will appear under Addresses with the rest of your contacts. Select "Import." In "File Format", choose the application from which you will import. Contacts can be imported in CSV format. 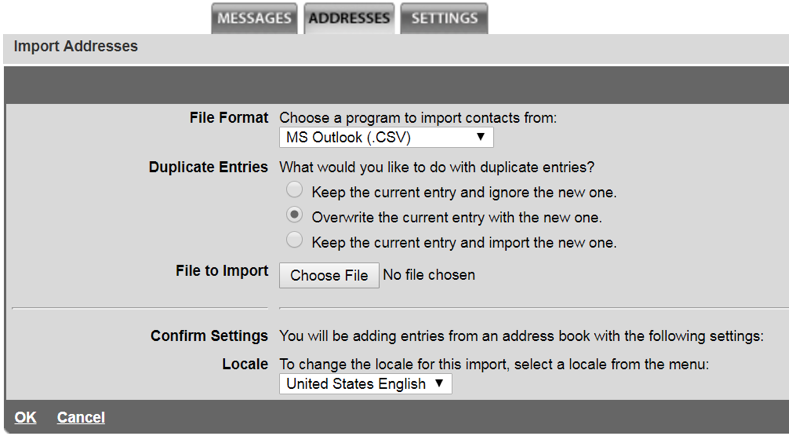 Under "Duplicate Entries," choose whether to keep the current email addresses or overwrite them with the new addresses. Click "Choose File" and locate the file you want to import. Choose the language preference in "Locale." And click "OK" to import your contacts. The "Addresses" window will display along with a message that states the number of successfully added and replaced contacts. Select "Search" and enter your keywords to define your search. Enter * for wildcard. Click "OK" to search.